2017 Update: We still stand by these stylish laptop totes and sleeves (and links have been updated! ), but you may want to check out our more recent roundup of the best laptop bags for work. We haven’t done a roundup of computer bags and laptop sleeves in a THOUSAND YEARS, so I thought we’d take a look today. Ladies, do you have any trusty laptop totes? Do you prefer a laptop sleeve or an entire tote for laptops? Psst: we’ve talked about how to lighten your load in the past, as well as how to save your back while commuting. 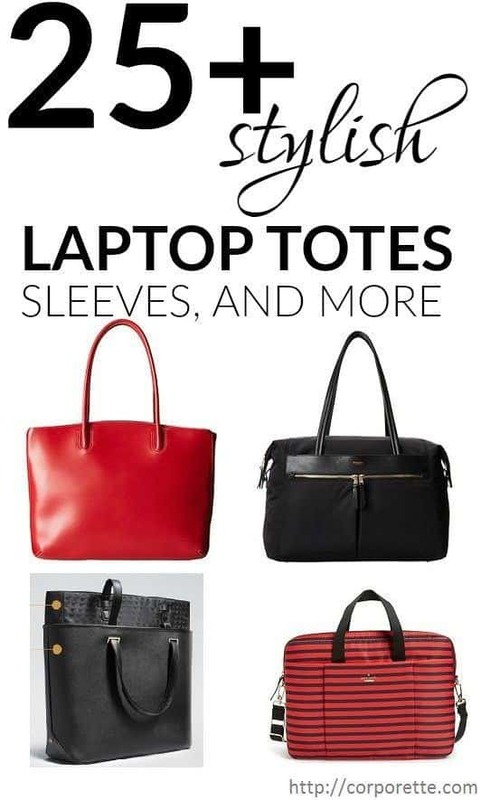 Readers, what are your favorite stylish laptop totes? Do you prefer laptop totes or laptop sleeves — or a more old-fashioned computer bag? 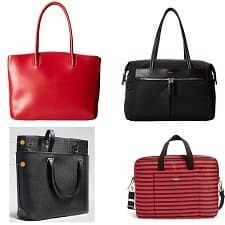 I’ve mentioned this here before, but I’ve used the Women In Business Thoroughbred tote in both black and tan for the past 3 years an I swear by them. Available for $65 on Amazon and $100 on the WIB site. They’re mostly nylon so lightweight, well structured, and roomy enough to carry a laptop, all the extra bits, plus a wallet, pens, phone, and some other basics like a snack or small water bottle. Love the Lodis Audrey. 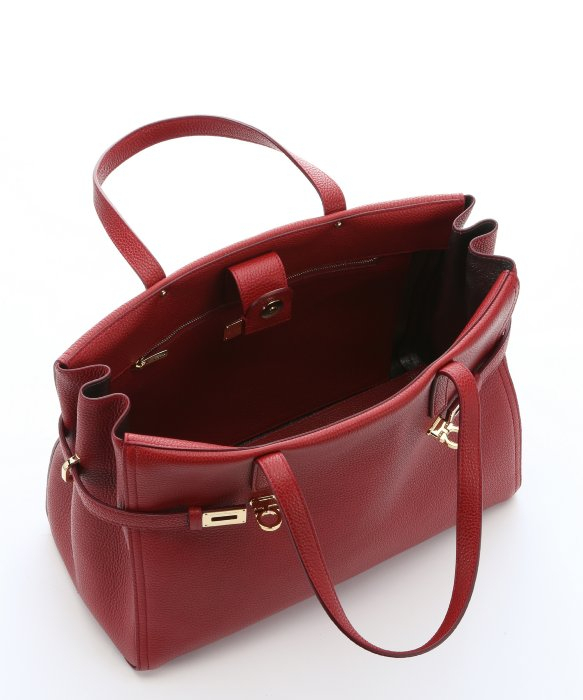 Have a more structured Lodis Audrey tote, want this one as well! 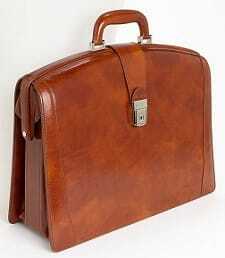 I have seen the Bosca briefcase in real life, and I can confirm it is pretty heavy. Even my husband thought it was too heavy for him. 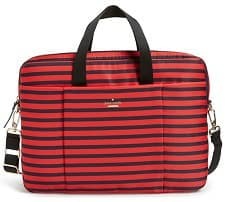 Has anyone seen a case that is basically a laptop sleeve but with small carrying handles? Basically a hybrid between the pink sleeve above and the Kate Spade bag. Some nights I need to take home just my laptop and a folder or two plus my purse, and I don’t want to carry a large bag (because the amount of stuff I carry will expand to fit the size bag I have, that’s just how I am) but I need handles to juggle getting my stuff back and forth to the car. Last time I saw one I remember thinking “what use is that, it won’t even hold a charger, etc?” but now I have a separate charger for at home and at work, so I get it now. My laptop is pretty much file folder sized, so I’m pretty much looking for around 9″ x 12″. Any suggestions? And duh, searching “laptop sleeve” and “handle” together gave me some promising options – but I’d love a specific recommendation if anyone has one. Incase makes a couple of bags that fit what you are looking for. I have an older version of the “Sling Sleeve” https://www.incase.com/shop/bags/incase-sling-sleeve-for-macbook-pro-13/ , 4 years old and still going strong. I like the look of their “City Brief” as well. Knomo makes them, basically a quilted sleeve with a handle and shoulder strap. I love it. Does anyone here use Class Pass? HOw do you like it? Would you recommend it? I used Class Pass for a few months and really loved it. There were many studios within 2 miles of my home so there was always something new to try and I never got bored. It did lead me back to Bar Method (which I had done previously a few years earlier but dropped due to expense and lack of motivation). What I didn’t like about CP was the limited times that certain classes at certain studios were offered and how you could only visit each studio 3x per month. There always seemd to be a bit of “selling” from the studios to get you to join theirs exclusively. But I do recommend trying it to see what works for you. I love ClassPass. I’ve been using it for a year, and it has definitely been a motivator for me to drastically increase the amount I work out. I find that I have about 5-6 gyms that I really love, and I just hit the max number of classes on those. Every once in a while, I’ll try somewhere new. Since most of these gyms are around $200/month for unlimited classes or $25/class, I am definitely saving money for me. I recently got this Victorinox Divine tote for steal from Rack in an orchid color. It is so thoughtful and lovely. It even has the slide over your suitcase feature for travel, but alas, no cross-body strap. It has one gajillion pockets and really nice finishing and a 10 year warranty. I will use this a ton. I absolutely love my original Alesya Bag (in eggplant) and am dying to get myself one of her new Work Satchels. My leather COACH Crosby Leather Caryall is the BEST! It is big enough to schlep alot of things, and also sturdy, so I do NOT have to worry about it. Also, b/c it is LEATHER, I can scuff it, and get it back to new by letting my cleaneing lady buff it up with SADDEL Soap and Mink Oil. But you do NOT want to loose it b/c it was about $400, and peeople would LOVE to steal it in the Subway. FOOEY! I just got the Victorinox Harmony backpack. I have problems with my back/shoulders that prevent me from carrying a bag on one shoulder for more than a few minutes. The Victorinox is obviously infinitely nicer than my old “standard issue” backpack, and honestly, it’s actually quite sleek looking. It’s also very lightweight (and easily cleanable!) because it’s just Nylon. My one complaint would be that because it is so sleek, there’s not room for much beyond your laptop, a notebook, a wallet, and some keys. 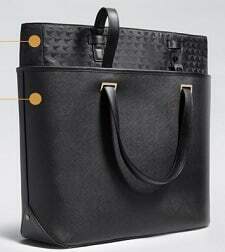 Has anyone purchased The Lo and Sons, Seville bag? I’m super interested but haven’t been able to find any solid reviews online. Just a few sponsored posts from fashion bloggers. Any insight is appreciated! I’m curious myself. I was *this close* to buying one before their end-of-year sale expired, but just didn’t do it (I’d spent too much money already, I guess.) Now I’m waiting until their next sale, whenever that is. 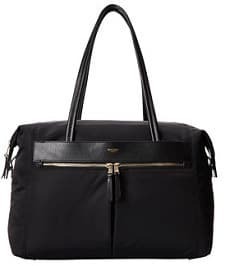 It seems to me like the holy grail tote I’ve been looking for– simple, non-branded (and non-blingy) tote for every day and for travel. Yes! I got it for Christmas (after not-so-sublty pointing it out to my husband) and I LOVE it. It fits nicely over my shoulder and is very lightweight. After putting my computer, a notebook, a small file or two, and my little clutch, there is still plenty of room for other things. I wish that there was more than one pen pocket, but I just put my two other pens in the bigger “stuff” pocket. I haven’t traveled with it yet, but i did try out the soft travel cover thing and it worked great with my suitcase. It doesn’t look as nice as the leather outer, but it is nice on its own. There is plenty of room for a laptop, wallet, phone, keys, pens, lipstick, power cord, etc. and a good many papers. But I am admittedly an electronic document person. I like for air travel as well as it sits nicely on top of my rolling luggage. I like how it doesn’t look like a laptop bag, so if I take it to dinner, etc. it doesn’t look like I am toting my computer around. I love my Knomo Grosvenor! I am obsessed. A fairly new company, but I have had my bag for over a year now and love it more than ever. 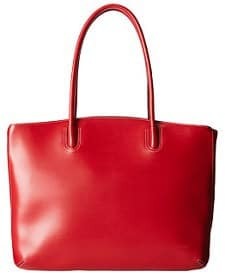 I recommend the Dagnedover tote! Can you tell me about the zippers? I got one before I got my Daame bag and was sooo disappointed because I love the design but the zippers started snagging before I had even loaded it up. They also felt HUGE and that made them look cheap to my eyes. That was when the company was new and I did send a detailed email with my return. Would you say the zippers are improved? Straps – I want straps to go over my shoulder! Crossbody does not work with my torso and the smaller handles don’t make sense to me. place for water bottle – Why do laptop bags not have a specific spot for water bottles? I’ve resorted to dangling one off my bag with a caribeaner. Price – I’m not to the point where I can justify spending more than $100. If I traveled more or had to take work home more, it would be a different story.